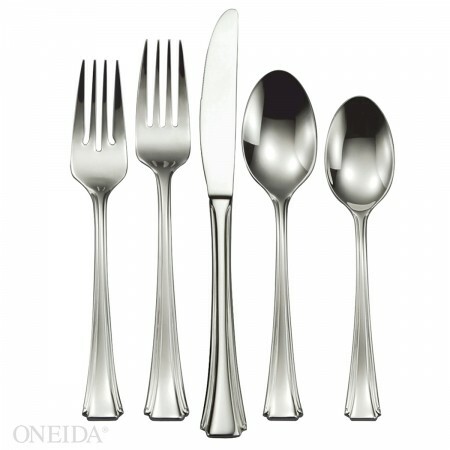 The most important aspect in choosing a flatware pattern is metal composition. In order for a metal item to be classified as stainless steel in the U.S., it must contain a minimum of 13% chromium (chrome). For many years, entry-level flatware was imported into the U.S. in this formulation, but it simply did not hold up. So, the accepted minimum formulation became 18% chromium (18 chrome or 18/0). To this day, much of the higher volume flatware patterns are 18/0 and many are made in many factories under the same or similar brand names (e.g. Windsor, Dominion, Old English, Beefeater). The fact of the matter is that most operators consider their flatware to be disposable. Even more undeniable is the fact that this product will turn gray, it will rust, it will pit, it will corrode and it is much more likely to be thrown away by careless staff. Low temperature dishwashers also affect 18/0. Many users decided that this type of performance would not do, so manufacturers began adding nickel to the metal alloy to help the ware keep its luster and sheen and to make it impervious to rusting, pitting and corrosion. You will often see them represented as 18/8 or 18/10. That means in addition to the 18% chromium, the alloy also includes either 8% or 10% nickel. It will retain its out-of-the-box luster for years to come. It’s important to note that nickel is a soft metal and flatware patterns with nickel are more susceptible to abrasions from handling and warewashing. Most 18/10 patterns are heavier than 18/0, but this is mostly due to the fact that they are targeted toward a higher end customer. Oneida is currently offering several extremely heavyweight 18/0 patterns to bridge the gap between weight and price. Stainless steel is a commodity; so two other key aspects are weight and sales volume. Like anything else, if it weighs more, it probably costs more. Conversely, if a factory can produce 10,000 dozen of an item at a time rather than 1000, it only stands to reason that the price would be more affordable.